A talented ensemble cast delivers laugh-out-loud performances in this "fun nostalgia trip". 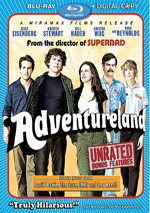 (Richard Roeper) When Matt Franklin's (Topher Grace) high-school crush Tori (Teresa Palmer) shows up at his dead-end mall job, he and his buddy Barry (Dan Fogler) devise a wild scheme for Matt to finally win the girl of his dreams. But only time will tell if Matt can seduce this gorgeous goddess at a wild party and survive an outrageous night of seduction, destruction and debauchery. Take this hilarious comedy home tonight! $3.464 million on 2003 screens. Evidence you’re Officially Really, Really Old: when your early adult years turn into nostalgia. Such is my sad fate, as the 1980s – half of which I spent as an adult – receive more and more attention as Ye Olden Dayes. Set over Labor Day Weekend in 1988, recent college grad Matt Franklin finds himself at a crossroads. Though he got a nice degree from MIT, he doesn’t know what he wants to do with his life, so he works at a mall Suncoast and tries to buy time from his dad (Michael Biehn) so he can figure out what to do. Matt maintains a crush on old high school prom queen Tori Frederking (Teresa Palmer) and gets excited when he bumps into her at the mall. She mentions a party she’ll attend that night and tells him he should come as well. Of course, Matt leaps at this chance, though he lies to Tori to make himself look more important. Rather than admit he works at Suncoast, Matt pretends that he’s a big banker. Who’ll throw this party? Kyle Masterson (Chris Pratt), the boyfriend of Matt’s twin sister Wendy (Anna Faris). She has her own life crossroads: they plan to move in together, but she applies to Cambridge and may want to go there instead. She has to work through those issues, and we also get to know Matt’s best pal Barry Nathan (Dan Fogler). Instead of college, Barry took a job at a high-end car dealer – a job he loses. As revenge – and to help Matt look the investment banker part – Barry “borrows” a car from his former place of employment and they all embark on a wild night. Virtually every modern comedy set in the 80s takes the campy Hot Tub Time Machine approach, and that’s what I expected from Home. After all, that’s essentially the view of the decade: big hair, gaudy colors and peppy pop music. However, Home takes a different approach. Rather than go with the 21st century view of the 1980s, it essentially treats the material like it was made in the 1980s. Not that it looks like a perfect period piece, but it does have a real era-specific feel – and in a pretty subdued manner. It would’ve been easy for the flick to pour on the cheap 80s accoutrements, and some are there, but in a surprisingly low-key way. If you expect the usual campy take on the topic, you’ll not find it here. And I regard that as a good thing. Home does wear its influences on its sleeve, but rather than take the uber-80s camp feel, it goes after some of the decade’s more serious “coming of age” efforts like Say Anything and Risky Business. It throws in some of the expected wackiness, but almost half-heartedly; it feels like the movie wants to be more of a traditional drama than the nutty teen comedy it came across as in ads. All of this helped make Home more engaging than expected, though it’s not without flaws. For one, it does tend to drag at times, and the secondary characters don’t receive enough attention. I know that this is supposed to be Matt’s tale, but Wendy and Barry get left on the sideline a bit too much. They have their own arcs, but those don’t develop as well as I’d like. I also think the movie includes too many actors who’re far too old for their parts. The majority of the main cast features performers in their early to mid thirties; only 25-year-old Palmer gives us an age-appropriate actor. Yeah, they usually look younger than their actual ages – except 34-year-old Fogler, who probably couldn’t pull off 22 when he was 22 – but they still seem wrong for such young roles. That’s not a huge distraction – and I suspect the fact that most of the cast is in their thirties actually hides their “advanced age” to a degree. Most of Take Me Home Tonight provides a loving homage to the 80s coming of age drama without seeming too self-conscious about it. It hearkens back to the era but doesn’t bludgeon us with winking pop culture references and other nonsense. That helps make it a fairly sweet and endearing tale. Take Me Home Tonight appears in an aspect ratio of approximately 2.40:1 on this Blu-ray Disc. The movie came with a good but not exceptional transfer. For the most part, sharpness looked good. Occasionally, the image could be a smidgen soft, though I think some of that stemmed from the film’s “80s throwback” photographic design. Overall definition remained positive. I noticed no issues with jagged edges or moiré effects, and edge haloes remained absent. I did see a few small blemishes, though. Colors worked well. Though the movie didn’t go for the expected neon 80s palette, it featured intentionally heavy tones that came across nicely. These were full and rich. Blacks seemed deep and tight, while low-light shots demonstrated appropriate clarity. This ended up as an acceptable presentation that was just a bit below Blu-ray expectations. As for the film’s DTS-HD MA 5.1 soundtrack, it offered a music-heavy affair. The movie boasted an era-specific-heavy mix of tunes, and these demonstrated nice stereo presence that also spread to the rear speakers in a decent manner. Effects had less to do, though, as they tended toward environmental information. Even the occasional driving scene didn’t have much to do; a climactic scene in a rolling metal ball was the only sequence that used the back channels in an exciting manner. Still, the mix was suitable for the story. Across the board, audio was positive. Music showed nice dimensionality and range, and effects displayed similarly good accuracy and distinctiveness. Speech always came across as natural and concise. The audio’s general lack of ambition made this a “B-“, but the soundtrack fit the film. Only a handful of extras fill out the package. Cast Get Together runs eight minutes, 12 seconds as it shows a chat among a handful of the flick’s actors: Topher Grace, Anna Faris, Dan Fogler, Chris Pratt and Teresa Palmer. They talk a bit about their impressions of each other, characters and story, and some aspects of the shoot. The chat never becomes terribly informative, but it has some fun thoughts and even tosses in a little audition footage and other material as well. Seven Deleted Scenes fill a total of 11 minutes. We find “Picking Blinds” (1:35), “Driving with Wendy” (2:05), “Barry Fired” (1:40), “So You Are Rich” (0:45), “After Proposal” (2:30), “To the Victor” (0:38) and “Carlos Outtakes” (1:47). A lot of these fall into the exposition category, and they’re actually fairly useful, as they help flesh out some narrative themes and character elements. For instance, we learn more about Barry’s former job and the relationship between Wendy and Kyle. Not all soar, and they might’ve slowed down the pace, but they do give us nice background and detail. Under Music Boombox, we get an alternate form of chapter search. It lists 12 of the movie’s 80s songs and lets you jump directly to the scenes in which they appear. One nice addition: each tune also offers text that gives you info about it. A music video for Atomic Tom’s take on “Don’t You Want Me” appears. This includes some of the requisite movie scenes, but it features a unique story with the movie’s cast that allows them to refer to a slew of 80s flicks – and 1990’s Ghost, which shouldn’t be there. The rest are decade-correct, though – at least I think so, as some fly past quickly – and the video is a total blast. The disc opens with ads for Cedar Rapids and Season of the Witch. We also find the trailer for Home and two TV spots. On a second platter, we find a digital copy of Home. As usual, this allows you to move the movie onto a computer or digital viewing thingie. As usual, I don’t care. Going into Take Me Home Tonight, I anticipated a campy, goofy Eighties-inspired piece of fluff. To my surprise, the movie actually offered a likable coming of age tale; it wears its influences on its sleeve but does them reasonable justice. The Blu-ray provides fairly good picture and audio but skimps on supplements. Still, it presents an enjoyable movie well.